By Roy Gerrard. Farrar, Straus and Giroux, 1989. Where the mountains meet the prairie, where the men are wild and hairy/There’s a little ranch where Rosie Jones is boss. It’s a place that’s neat and cozy, and the boys employed by Rosie/Work extremely hard, to stop her getting cross. The cadence of the words is enough to pull you in. But come on, don’t you already want to know what happens next? 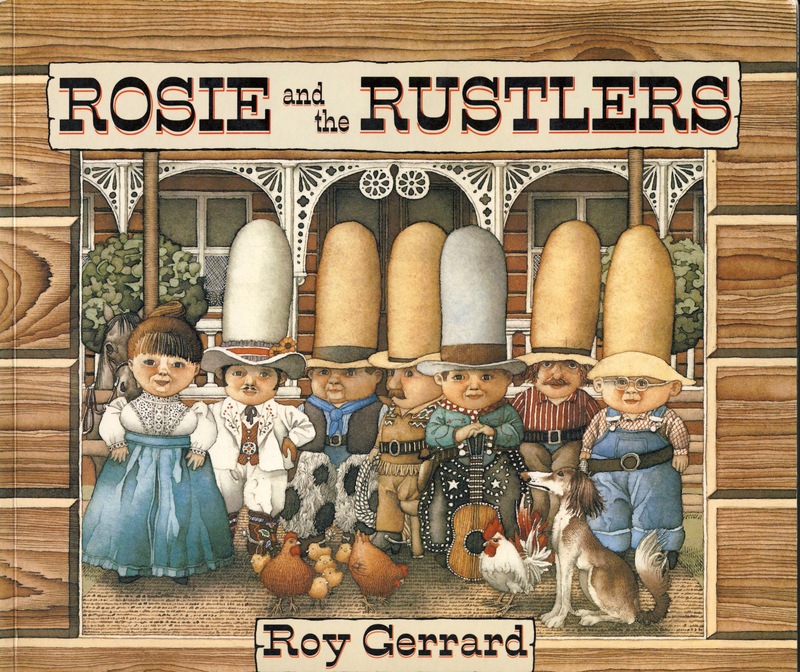 In a nutshell, Rosie’s men — including One-Leg Smith, Salad Sam, and Utah Jim who’s nice but dim — find themselves in pursuit of a gang of outlaws who tried to steal their steers. And so the “hazardous adventure” begins. Not to worry, it all ends well. The bandits (and their cabin) are lassoed, the townspeople applaud, and Rosie’s boys even get a reward from the sheriff. I would be remiss not to mention the enchanting, 80’s-era illustrations. The characters look like a sort of Wild West version of trolls, with overly round faces, wide eyes, and arms as short as a T-rex’s. But you just. Can’t. Look. Away. One day, while their red-hot beans were cooling in their three dishes, the bears went out for a walk. And just as soon as they turned their grizzly backs, something strange came blowing out of the woods. It’s hard to improve on the original, but this way out West interpretation of Goldilocks and the three bears is funnier than a [insert appropriate metaphor here – ie, “a greased pig tryin’ to square dance up a flag pole?”] Stead porridge, them bears eat blazin’ hot beans. And crusty, skunky Dusty Locks is so named because she hasn’t “had a bath in a month of Sundays.” Needless to say, Trouble is her middle name. Extra points for the hilarious last page, in which a cranky (but finally clean!) Dusty, dressed like a li’l cowgirl, is dragged into town by her mama – and spotted by a keen-eyed Baby Bear.